Below is full list of all our Africa Tours, which is now split into three sections – our Namibia Tours, The Namibia & Botswana Safari Tour and our South Africa Tour. Please scroll down to find out more. Interesting flora in a challenging climate. The amazing geology with its inselberg, limestone ridges stretching for many kilometers and its mineral wealth add to the overall interest. A huge country with a small population which gained its independence only in 1991. Eco tourism has been encouraged. For our Desert tour, the highlights are ancient Sossusvlei dunes and the haunting Dead Vlei are one of the world’s wonders. Fish River Canyon in the south is the second largest canyon in the world. We discover the Namib desert, the Kalahari dunes and the coastal Atlantic dunes with rich birdlife in the lagoon and intriguing wildlife hidden in the dunes. The hauntingly remote Skeleton Coast tour is a great highlight. 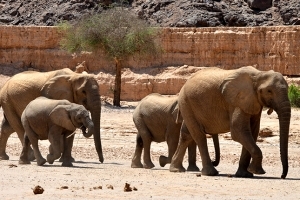 The desert-adapted elephants and giraffe are discovered. We stay in one of the only permitted lodges in a private concession. Included is Etosha National Park teeming with wildlife around the waterholes. The Park has a massive salt pan covering over 4700 sq kms. We have chosen lodges deeply involved in the conservation and protection of rhinos, cheetah and a desert lion project. 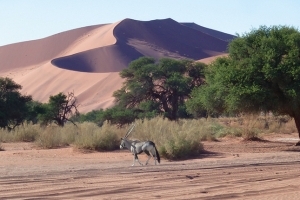 A superb Namibia safari tour with exceptional lodges and a unique itinerary. March is the green season for our safari tour benefitting from the summer rain in the Angolan highlands. Starting in Northern Namibia which is lush and is perfect for wild flowers and butterflies. The amazing wildlife in Etosha National Park is one of the highlights. Along the Kavango river to the Zambezi region (former Caprivi Strip), discover snorting hippos and superb birdlife, bee-eaters and kingfishers. 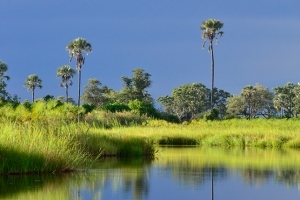 On to Botswana and the extensive Chobe River to enjoy the elephant herds. We discover the exceptional Victoria Falls during a day in Zimbabwe. The highlight of our safari tour is Pom Pom Camp in the Okavango Delta only accessible by charter plane. Birdlife and wildlife abound and our morning exploring the waterlily-lined Delta water channels in a mokoro boat is unforgettable. 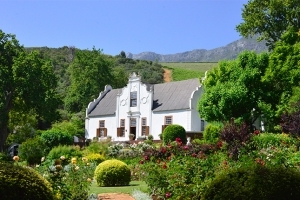 Our South Africa Garden Tour is based in The Cape. After visiting superb private gardens around Cape Town and Stellenbosch for a week, we add three days in the Little Karoo staying in San Bona, an exceptional wildlife conservation reserve. Little Karoo fynbos, the superb indigenous wild flora combines well with the wildlife in the 50,000 hectares of reserve. We have added a couple of days at the Grootbos Conservation Reserve surrounded by their unique rich fynbos on the coast near Hermanus. Southern Right whales and their young can be spotted on the coastal cliffs. Our selection of superb Private Gardens of the Cape adding wildlife reserves to the programme gives a special unforgettable itinerary.